What Happens When You Open a Personal Injury File With A Lawyer? You’ve been injured and you want to retain a lawyer to represent you in your claim for compensation for your injuries. But what happens now? What happens when you open a personal injury file with a lawyer? We understand that this might be your first time at a lawyer’s office or the first time that you have been involved in an accident, and this entire process might be new to you. While every file is different and while depend on the particulars of the case, below is a general outline of what may happen when you open a personal injury file with our office. If you have been injured, contact Moustarah & Company to book a free consultation. At our office, you will be greeted by our valued support staff and you will meet our team of dedicated and client-focused lawyers. We’ll listen to you, assess the situation, help you to understand the law and your rights, and provide you with an outline of your options going forward. Click here to learn more about what you can expect when you book an initial consultation with our office. You’ve been hurt. Now it is time to get better. Your treatment and recovery are important. Your injuries and your recovery will direct how your claim proceeds. Much of your involvement in the day-to-day of your file will consist of attending treatments with your medical professionals such as your family doctor, specialists (as applicable), physiotherapist, chiropractor, massage therapist, or acupuncturist, and following their advice. If you have been injured in a motor vehicle accident, Accident Benefits (Section B) may provide coverage for medical expenses and financial losses suffered as a result of a motor vehicle accident. These benefits are provided through your own policy of motor vehicle insurance. Medical expense coverage may include physical therapy, chiropractic treatments, acupuncture services, and massage therapy among others. You may be entitled to income replacement benefits, if you cannot work as a result of the accident. If you are not covered by a policy of insurance or were involved in an accident other than a motor vehicle accident, such as a slip and fall, you may have to initially cover the cost of your physical therapy, chiropractic treatments, acupuncture services, or massage therapy out of pocket. Other options such as assignments or advances may be available to help you cover the cost of treatment, depending on the circumstances of your case. Depending on the extent and duration of your injuries, we may arrange for you to undergo assessments with medical experts. These assessments will help us get a better idea of your injuries, the impact that they have on your life, and the care that you may require going forward. The expert will then prepare an expert report which we may use in preparing your settlement proposal, in negotiations with the other side, or at trial. Likewise, where you are covered by a policy of Accident Benefits (or Section B) insurance, your own insurance company might send you for a medical assessment to determine what treatments are medically necessary for you to undergo going forward. The defendants (“the other side”) also have the right to send you for an Independent Medical Examination (“IME”) with a doctor of their choice to assess the extent and effect of your injuries. Their expert will also prepare an expert report and may testify in court for the other side if your case goes to trial. 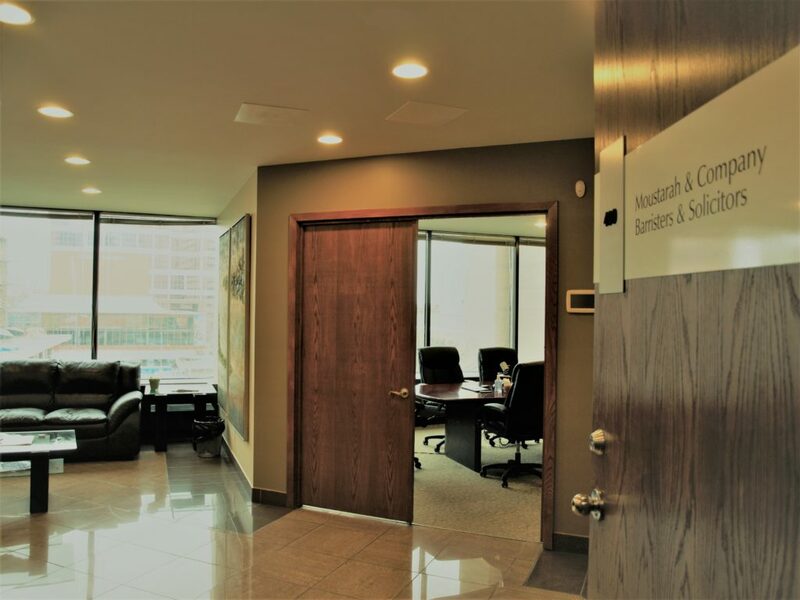 At Moustarah & Company, we understand that these assessments might seem intimidating, and we will do our best to put your mind at ease and explain to you what you can anticipate from these assessments and IMEs prior to attending. At some point prior to your claim’s applicable limitation date, your lawyer may file a Statement of Claim on your behalf in court. Simply put, a Statement of Claim is a document setting out the main facts and allegations in your case against the other side. Once you are ready to settle your claim, your lawyer may put together a settlement proposal. A settlement proposal can be formal or informal, but generally it will set out the relevant information and the types and amounts of compensation claimed. The settlement proposal forms part of the negotiations process between your lawyer and the insurance company or lawyer for the other side. Sometimes the other side will provide a settlement offer. If the other side puts out a settlement offer, your lawyer will discuss the offer and your options with you and you will decide where to go from there. If an agreement on compensation is reached, then the claim is ready to be settled. Your lawyer will provide you with some paperwork to sign, acknowledging the terms of the settlement and releasing the other side from any further claims. It may be that your personal injury file goes to “questioning” or “discoveries”. This is an evidence-gathering process where both you and the other side disclose evidence. The goal is to clarify the issues and facts of the case, often in preparation for the matter proceeding towards trial. The actual process typically takes place in the boardroom. Parties are questioned under oath. You may be questioned by the lawyer for the other side. Your lawyer may question the party on the other side. A court reporter will be present to record the questions and the answers. Your lawyer will continue to negotiate on your behalf with the other side in order to come to a settlement agreement. If they are unable to reach an agreement, your personal injury file may go to an Alternative Dispute Resolution (“ADR”) process such as Judicial Dispute Resolution (“JDR”) or Mediation. In Alberta today, most personal injury cases do not go to trial. Most of the time, through negotiations and the exchange of information, the parties can come to an agreement on compensation. In fact, in order to schedule trial dates in Alberta, the parties must show that they have first made a good faith attempt to settle the claim. However, it is still possible that your personal injury file might get to the trial stage. If it does, your lawyer will take your claim to court and present evidence and arguments to the judge on your behalf. Ultimately, the length of time it takes to settle a your personal injury file or get a judgment depends on the particulars of that specific case. It is important to consider the outcome of your injuries and how this may affect your physical, mental and emotional health long-term before settling your claim. As a result, the time it will take to settle or get a judgment in each case will depend on each person’s particular injuries and circumstances.